Chain, Chain, Chain. It’s everywhere and I love it all. In the summer I want my jewelry to be light and airy and chain is perfect for that. So using Blue Moon Beads small black and gold chain and a decorative chain with Pearls captured within the links I added more Blue Moon Beads and came up with these great summer bracelets I’ll be wearing this year. Oh and not to forget the pretty earrings I whipped up in no time. 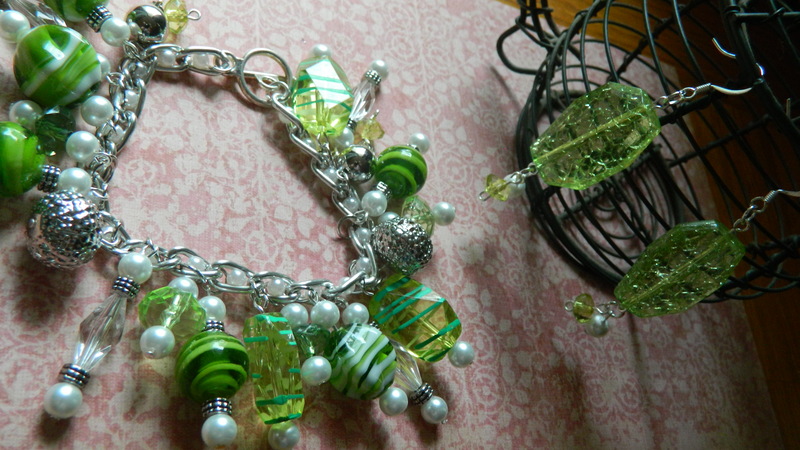 This is a simple little bracelet, that took nearly no time to put together. Using Blue Moon Beads 27″ Metal Chain in Black and Gold, I cut two 7″ pices of Black chain and one 7′ piece of Goldtone chain and sandwiched the Goldtone chain between the Black chain. The I pulled out some Blue Moon Beads Urban Warrior charms added those to the chain, added a clasp and in 20 minutes I had this nifty lightweight bracelet. This next bracelet is fun, colorful and prefect for hanging out with friends at your local aquarium, Sunday brunch or even riding around in the boat on the lake. Grab a 7″ piece of the Blue Moon Bead Silver Metal chain with Pearls captured in the links (this is such a pretty chain in itself, all you would need is to add a clasp). For me more is always less, I’m just that kind of gal. 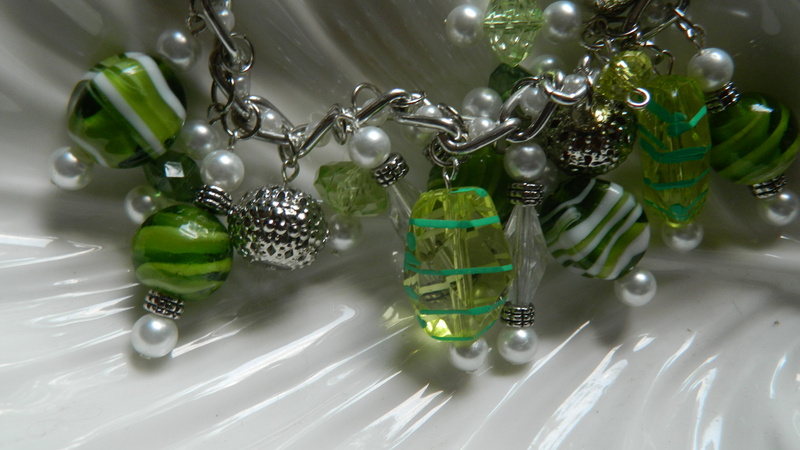 So I grabbed the Blue Moon Bead Tin Mix, Melon Ball and Mud Pie, Blue Moon Beads 6MM White Pearls some silver plated head pins and made lots of pretty dangles. 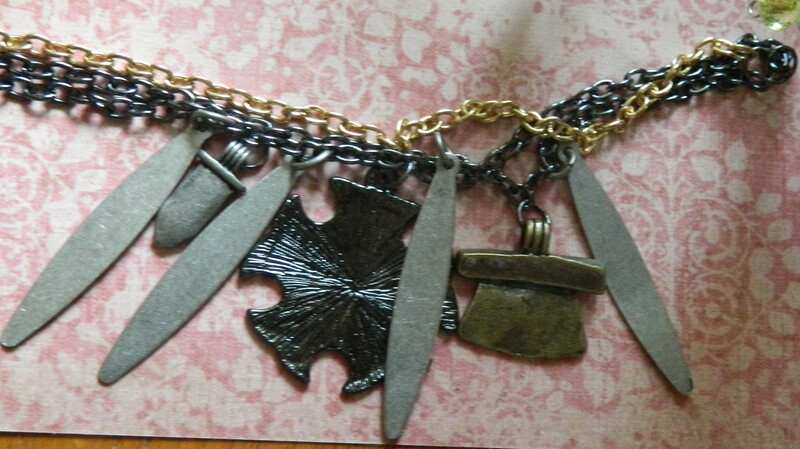 Attached those to the chain with silver plated jump rings and added a toggle clasp. Fun and Flirty for summer. I had a couple of the Blue Moon Bead Tin Mix, Melon Ball beads left over so I took 5 minutes and whipped up this pair of earrings to match the bracelet. Beads, head pins, make a few loops, attach jump rings and ear wires. Thats all there is to these simple earrings.